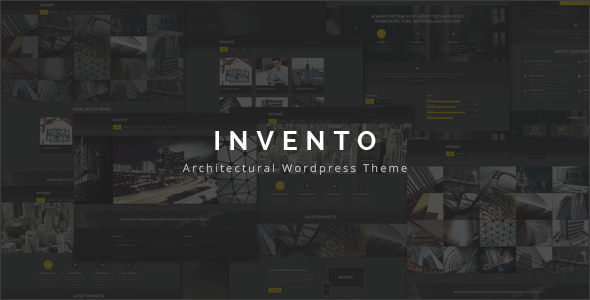 We have equiped our Invento Architectural Theme with 5 Home Page Layouts and also we have added several differnt layouts for portfolio, 5 layouts for Single portfolio page,and 3 differently visualised Blog pages so you defintely would be able to find one which would match your needs. --Own embed code option has been added for portfolio posts. --Klb Shortcode has been updated. --Translation option has been updated. --Grid layout option has been updated. -- Particular home section has been added. -- Woocommerce has been updated. -- Tgmpa has been updated. -- Google api key option has been added. -- The bug was fixed. -- Load more problem has been fixed. -- Portfolio issue has been fixed. -- Feature of One Click Demo has been added. -- Portfolio has been updated. -- Visual Composer has been updated. -- Visual Composer was updated. -- The problem of wordpress v4.5 was fixed. -- Child theme was included. -- Portfolio Slider problem was fixed. -- The Color Bug was fixed. -- More Color option was added. -- Blog Header Option was added. -- Header Color Option was added. -- Footer Color Option was added. -- Search Button option was added. -- Background Option was added. -- Bug of Portfolio Filter was fixed. -- Header Default Option was added. -- Footer Widget was added. -- Video Tutorial was added. -- Twitter Widget was added.